The smallest Computer Collar® available. Additional collar for a 2nd pet on your Invisible Fence® Brand System. Lifetime warranty. Compatible with 700 & 800 Series equipment. The MicroLite® Computer Collar® is 30% smaller and lighter than any other pet containment collar. At less than 1 ounce it’s the most comfortable collar for dogs and cats of all sizes. The MicroLite® Computer Collar® includes a nylon lupine collar, backmount, posts, one Power Cap® battery and receiver. Training, flags and transmitter are NOT included. 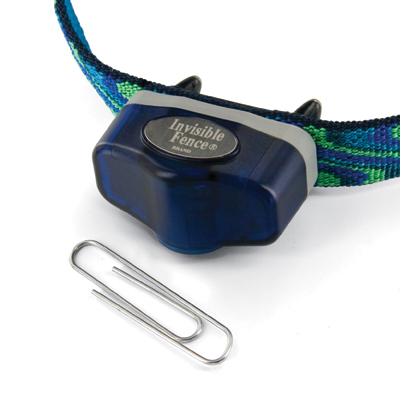 The MicroLite® Computer Collar® is compatible with Invisible Fence® Brand 700 & 800 Series Systems. Compatible transmitters are labeled ICT700, ICT725, ICT750 or ICT800. Please call customer service at 800-578-DOGS if you need assistance determining what equipment you have or if you’d like to upgrade an existing collar to the MicroLite® Computer Collar®. Soyez le premier à laisser votre avis sur “New MicroLite® Computer Collar®” Annuler la réponse.